Please review these specifications carefully. All files must meet the minimum requirements and be completely finalized. If a file fails to meet one or more requirements we will make every effort to contact you to correct the problem. If you cannot be reached we assume no responsibility for any subsequent delays, as your job may be rescheduled for a later production. All fonts in your document should be outlined (this is to avoid problems with defaulting fonts, especially unique/free fonts), and final artwork should be flattened. (in Illustrator CS use the "File > Export..." option). Make sure you uncheck "Layers" and select the document type to be "TIFF". Save your files(s). "Filters > Colour > Convert to Grayscale" (for the back). Once complete, re-save your file(s). Photoshop: once your artwork is complete, and you have flattened the file as mentioned above, got to menu item "Image >Mode > CMYK" (for the front), or "Image >Mode > Grayscale" (for the back). Once complete, re-save your file(s). for us to compare with. When submitting your files digitally, use our web upload facility (click here to access). 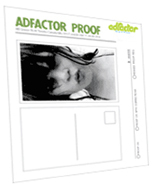 Should you encounter any problems uploading from this site, you can email files to adfactor@adfactor.com. In either case, please be sure you observe the file-naming requirements listed below. All files submitted for printing are considered final. However years of printing experience caution us that even the most thorough of proofing processes can leave minor errors undetected. Hence we have built in one more opportunity to check things over and avert costly re-prints, missed deadlines, or handing out botched material. Each file submitted is converted to a PDF ducument, placed onto a proof sheet and emailed to each client for final approval. We prefer emailing proofs as this is a faster process, however if you do not have access to an email address we can also fax you the document. This service is free of charge and will be done for every order you submit. However, should an error be detected and further adjustments are required, a $25 charge will apply. All orders are shipped using UPS Standard, unless otherwise specified. Your sales rep will co-ordinate the best pricing/timing for you when you place your order. To ensure that your order is printed and shipped out on time we require full payment, upon ordering, for any order less than $300.00. For orders over $300.00 a 50% deposit is required and the balance upon shipping or pick-up. To make a payment you can drop by our office at 1079 College Street, or call in your Credit Card information, at (416) 531.7907.